The Ocean Observatories Initiative team is excited about implementation of OOI 2.0 and advancing this community facility over the next five years. 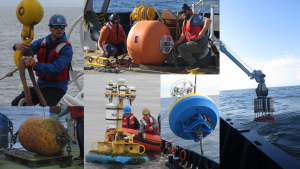 Phase two of OOI began October 1, 2018 following the award by the National Science Foundation of a cooperative agreement to Woods Hole Oceanographic Institution (WHOI) to host the Program Management Office. Operations and maintenance of observatory components remains as before with WHOI operating the Global sites and the Pioneer Array, the University of Washington (UW) operating the Regional Cabled Array, Oregon State University (OSU) operating the Endurance Array, and Rutgers, the State University of New Jersey operating the cyberinfrastructure that ingests and delivers data. One important change in OOI 2.0 is that the data assessment responsibilities, formerly at Rutgers, are now distributed among the marine operating institutions to provide better integration with the science and engineering teams, as OOI 2.0 puts renewed emphasis on data QA/QC and data access. The Global Array infrastructure deployments at the Irminger and Papa sites are ongoing – entering their 5th and 6th year of operation, respectively. OOI operations at the Irminger Sea Array are conducted in coordination with the NSF Overturning in the Subpolar North Atlantic Program (OSNAP), while OOI subsurface moorings and gliders at Papa are deployed in coordination with a surface mooring from NOAA’s Pacific Marine Environmental Laboratory. Deployments with reduced scope, consisting of a surface mooring only, are being conducted at the Southern Ocean Array in collaboration with the National Oceanography Centre (NOC), Southampton, UK. Operations at the Argentine Basin Array have been suspended. The Pioneer Array (Figure 1), serviced twice per year, is preparing for its 12th mooring service cruise. Several community PI projects have leveraged the Pioneer Array infrastructure, including the New England Shelf Long-Term Ecological Research (LTER) program. Observations from Pioneer, in conjunction with remote sensing and historical data, have highlighted new shelf-slope exchange mechanisms within a rapidly changing physical system with significant impacts on ecosystems. The Endurance Array (Figure 2) includes moorings, profilers and gliders off Oregon and Washington. The infrastructure off Oregon is tied into the Regional Cabled Array at the shelf and offshore locations. 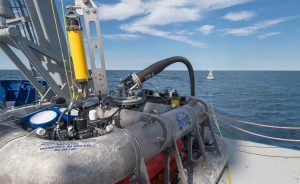 The full scope of the Endurance Array was first deployed in April 2015, and we are preparing for our eleventh Endurance Array cruise in April-May 2019. Significant technical improvements have been made across the array based on system performance. Among the many improvements, we have updated sensors (Satlantic ISUS sensors replaced with SUNA) and improved bio-fouling mitigation (UV biofouling protection added to dissolved oxygen optodes). Notable successes on the Endurance Array include observations of seasonal hypoxia events at multiple locations using fixed time series, profilers, and gliders. There are also moored multi-spectral optical attenuation and absorption time series from fixed depths and from profilers. While the OOI data portal is the source of all Endurance Array data, to better serve the regional user community, some Endurance Array data is passed through other widely used access points. Near real-time Endurance buoy meteorological and surface data can be accessed through NDBC. Recent near real-time Endurance Array data can also be accessed through the regional IOOS site, nanoos.org. OOI glider data is also passed on to the IOOS Glider DAC. The Regional Cabled Array (Figure 3) is now in its 5th year of operation. As part of the OOI 2.0 transition, the UW partnered with Pacific Northwest Gigapop to operate the terrestrial west coast infrastructure, which included moving the Cabled Array and CI servers to Seattle from Portland, Oregon. In addition, the UW is now responsible for the port agent drivers and data parsers for Cabled Array Core and PI instruments. The CI Machine to Machine interface is now being routinely used by the community to access Cabled Array data, and compared to samples for verification. The OOI Cabled Array Core infrastructure is enhanced by the addition of 13 “PI” instruments with funding from the NSF, the Office of Navy Research and Germany. 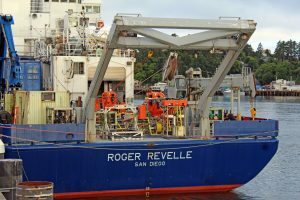 Newly installed PI instruments include two cabled multibeam sonars that are imaging all methane plumes issuing from the seeps at Southern Hydrate Ridge as well as a CTD-O2 sensor, two new geophysical sensors, the cabled COVIS multibeam sonar, as well as three uncabled thermistor arrays. The Shallow Profiler moorings continue to be work horses for the Cabled Array, having completed >30,000 profiles since 2015. During this next ~ six months, the Cabled Array team is working hard on platform and instrument refurbishment, and integration as testing in preparation for our 2019 cruise, which begins late May onboard the R/V Atlantis. The OOI cyberinfrastructure (CI) is a robust CI system architecture with established processes based on community best practices that allows 24/7 connectivity and ensures sustained, reliable worldwide ocean observing data any time, any place, on any computer or mobile device. Since the operations and maintenance phase of the project started in January 2016, the OOI CI system infrastructure has provided and continues providing extremely high uptime and quality of service, has served over 150 million user requests, delivered over 100TB of data to user from over 100 distinct countries across the globe. This CI architecture is being used as model by other NSF facilities.